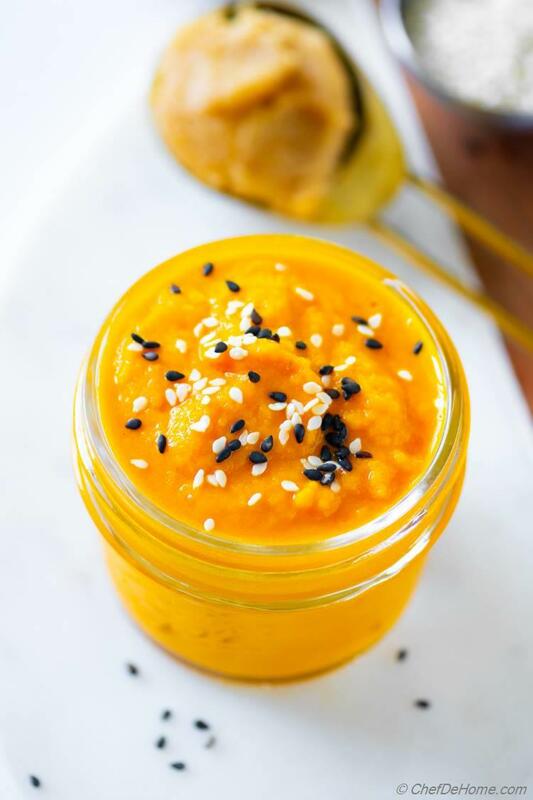 A clean Japanese-style Carrot Dressing with sweet and savory flavors of carrots, Miso, ginger and sesame. One dressing, two preparations - Salad Dressing and Dipping Sauce with change of just one ingredient. 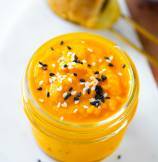 Sharing today, delicious Carrot Ginger Dressing with amazing flavor of ginger, sesame and miso. This creamy dressing has irresistible sweet and savory Asian flavors, needs only 5 minutes to blend and is very versatile. Use this with your favorite salad, make a dipping-sauce, and even as marinade. It is Dairy free, Nuts free, and Vegetarian. 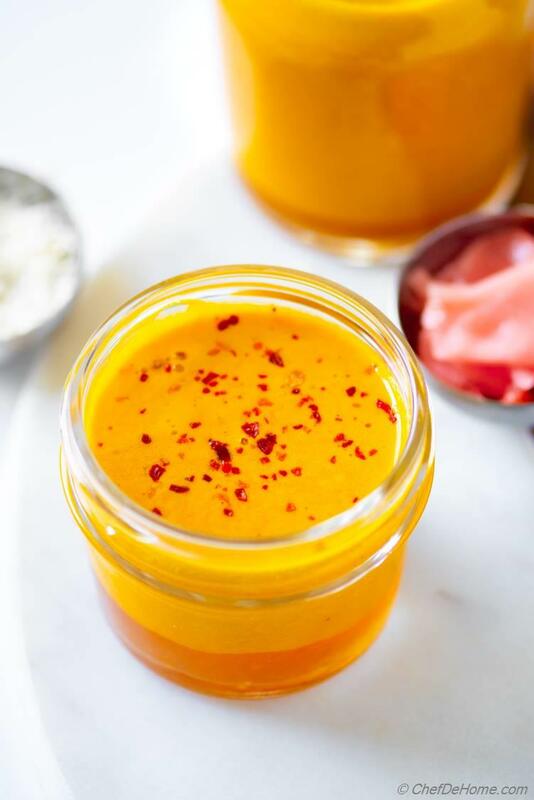 This Carrot Ginger Dressing recipe is also special because all ingredients of dressing are good for you. Carrots are good source of vitamin. Miso (fermented soy bean paste) is good for gut. Ginger is healing, and good for digestion. 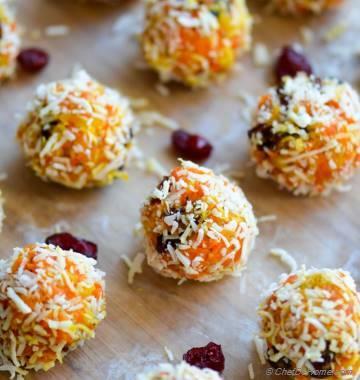 I sweetened it with Agave Syrup instead of refined sugars. Agave gives this dressing perfect amount of sweetness without processed sugar calories. 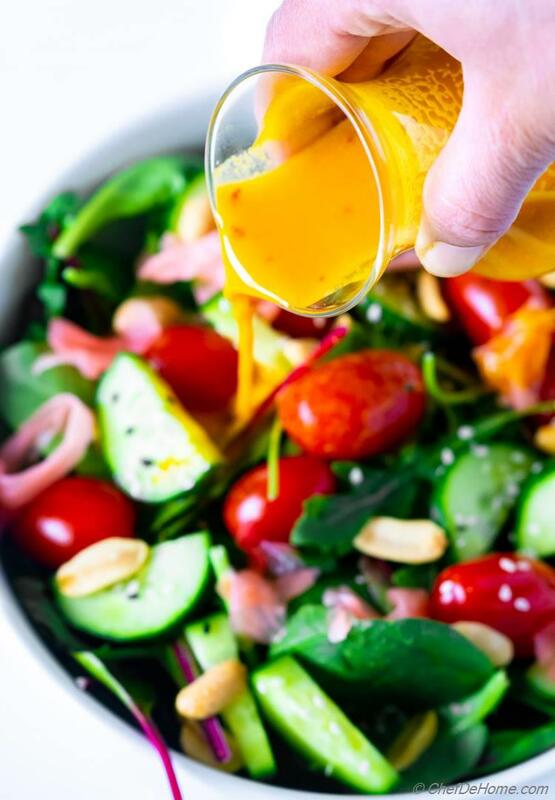 Above all, all ingredients in this dressing are clean, dairy-free, egg-free and nuts free. What not to like? WHAT IS CARROT GINGER DRESSING? You will find Carrot Ginger Dressing as condiment or salad dressing in most Japanese Restaurants. It's signature creamy sweet and sour flavor with spice of ginger never goes unnoticed. First time, I tried Carrot Ginger Miso Dressing in a Japanese restaurant with a green salad. The salad was very simple and crispy Asian green leafy salad which I love. But what won me more than lettuce was delicious Salad Dressing. Sweet and Savory Carrot Ginger Dressing with punch of miso and spice of ginger, sweet nodes of carrot were over-the-top delicious. Loved it. The main ingredients in Carrot Ginger Dressing are fresh ginger, carrots, white Miso paste, sesame oil, soy sauce, and rice vinegar. Some sugar or honey is used to bring out sweetness of carrots. I replace sugar with natural agave. But you can also use sugar/honey if you prefer. HOW TO MAKE CARROT GINGER DRESSING? 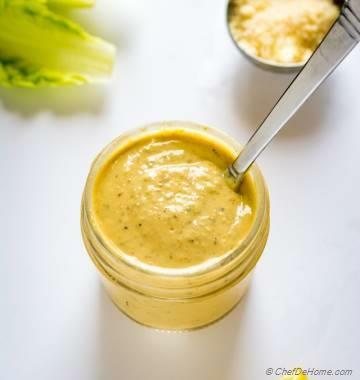 This dressing recipe is very versatile. Using same ingredients, you can actually make two kinds of Carrot Ginger Dressing. 1. 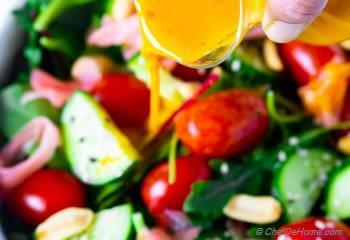 Salad Dressing: For Salad Dressing, I like creamy but still pour-able dressing. So, I use mix of whole peeled carrot and carrot juice. Whole carrot gives sauce some body and creamy texture. 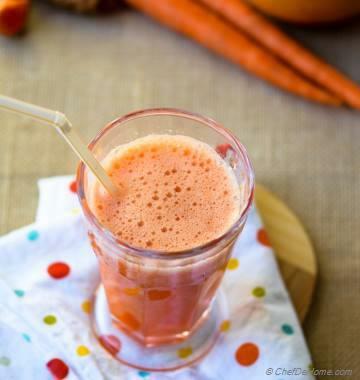 Carrot juice makes dressing pour-able without diluting the flavor. This dressing is also good marinade. It keeps good for a week. 2. Dipping Sauce: For Dipping sauce, I like thicker sauce which can be scooped with dippers. To make carrot ginger dipping sauce-style dressing, I use only whole carrots and skip carrot juice. The carrots make creamy thick Dipping Sauce perfect for dipping. If you don't like pour-able salad dressings? 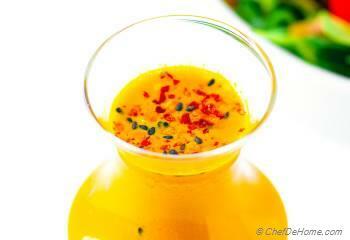 Feel free to use this method to make Carrot Ginger Salad Dressing. Let me sum-up this dressing recipe for you. 1. 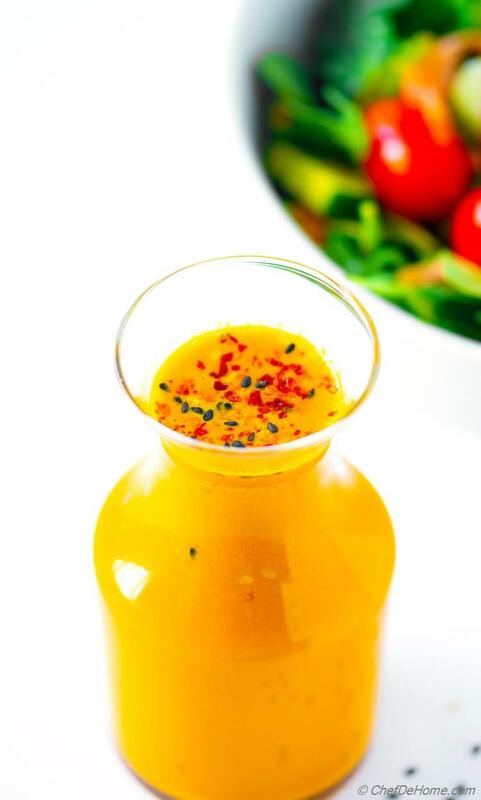 A healthy salad dressing with lots of good ingredients. Perfect to keep eating good-for-you salads this whole year. 2. Very versatile. Use this dressing for salads, marinade, or dipping sauce. 4. Above all, it's clean dressing without artificial colors, or preservatives. I wish you a beautiful day. Enjoy! 1. Peel ginger, carrot and rough chop. Add to blender jar with remaining ingredients. Pulse on high until dressing is pureed, smooth and creamy. 2. Taste and adjust salt. Dress your favorite green salad. Transfer remaining dressing to a container with lid. Refrigerate until ready to use. Dressing stays fresh for up-to a week. Carrots: Same recipe can be used for two kinds of dressing. For creamy version only whole carrots (as explained in Note 2). For Salad Dressing, use one carrot and rest carrot juice (as described in ingredients list). Dipping Sauce: For Dipping sauce, I like thicker sauce which can be scooped with dippers. To make carrot ginger dipping sauce, I use only whole carrots and skip carrot juice. The carrots make creamy thick Dipping Sauce perfect for dipping. Recipe remains the same. Only use 1 cup of whole carrots and don't use carrot juice. Add to blender with rest of ingredients. Pulse on high until pureed. If sauce is too thick, add 1-2 tbsp of water. Use as needed. Refrigerate until ready to use. Fresh Ginger: For best results, only use fresh ginger for this recipe. I'm trying to include Miso in my diet. This is my first time trying it in a Carrot dressing. Really loved it! Such good flavor! I have had salad three times in past 2 days just to eat this dressing. :-)) Thank you so much for sharing! Jacklyn, thanks for letting me know. I'm glad you enjoying Carrot Dressing. If this dressing get you to eat more salads.. Nothing like it!! Isn't it?! I love condiments that make me eat healthier. High Five!